The principle behind EFTEM is to illuminate a very thin specimen with a beam of high energy electrons. Some of these electrons will interact with the specimen and result in elastic or inelastic scattering. Inelastic scattering results in both a loss of energy and a change in momentum, which in the case of inner shell ionization, the energy loss is characteristic of the element the electron interacted with. The sample (A) produces an unfiltered TEM image (B), which has a lot of image detail but is hard to interpret. The prism transforms then the image into a spectrum (C). 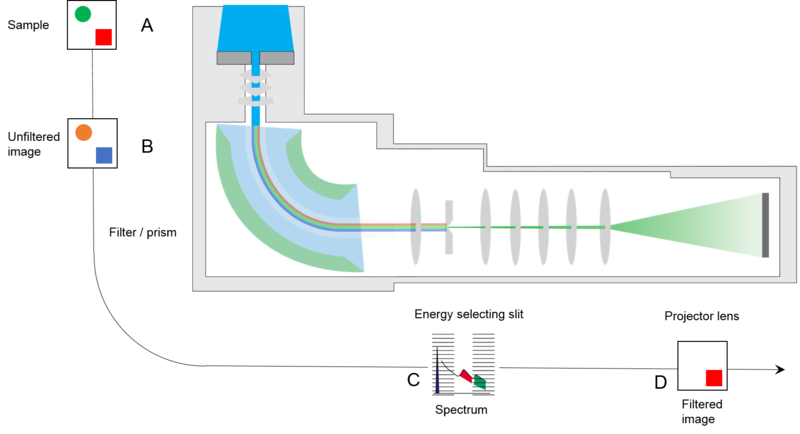 Next, an energy-selecting slit filters the spectrum. The selected part is transformed back into an energy-filtered image (D). Then a suitable detector collects the final energy-filtered image. After the electron energy loss spectrum forms in the energy filter, an adjustable energy slit allows only electrons that have not lost energy to pass through to form the image. This is known as zero-loss filtering. The filtering prevents inelastically scattered electrons from contributing to the image plus enhances contrast image and resolution. In addition to zero-loss filtering, you can adjust the system to select electrons that have lost a specific amount of energy to obtain additional contrast effects and compositionally sensitive images. Jump-ratio imaging is a technique that requires two energy-filtered images, one you position just before the ionization edge (pre-edge) and one you position just after the edge (post-edge). The resultant images are divided pixel-by-pixel to yield a qualitative map that is bright when the element is present and dark where it is not. The 3-window technique requires two images before the ionization edge and one after. You can use the pre-edge images to compute the approximate background contained in the post-edge window. Once the background is determined and removed pixel-by-pixel, the resultant map shows a signal that is proportional to the element concentration in the sample. Alternatively, you can obtain a series of images over a broad range of energies. Results will then contain a continuous range of energies. This allows quantitative analysis and improves the accuracy of mapping where more than one element is involved. This EFTEM data stack is known as a spectrum image.